Monica A. Coleman shares her expertise so that other people can have the tools and information they need to grow and thrive in meaningful ways. She guides individuals as they align their personal values with their professional goals. She consults with churches and institutions to coordinate ministries and curricula to be a force for creative transformation in the world. She believes that faith should not be a source of loneliness, rigidity or exclusion. Rather our faith can free us to be more and more of who and how God calls us to be. Coleman works with churches and ecclesial leadership on new media, church structure, religious pluralism, and integrating values with today’s context. She creates workshops for individuals as they wrestle with being faithful in the midst of great pain. 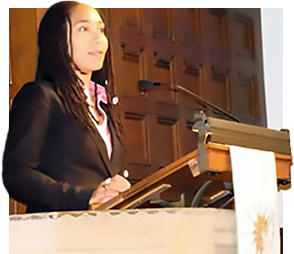 She leads clergy and church leadership to support congregations in their journeys to health and wholeness. Coleman guides faculty and institutional departments in incorporating their mission to curricular and assessment needs. She also helps students with academic success: graduate school and fellowship applications, curriculum vitae review, applications for fellowships in the humanities, academic job interview skills, and contract and project negotiation. In every context, Coleman helps others to see new possibilities while maintaining strength in their ideals. For more information, inquire here.